Tom O’Brien has had decades of varied experience that includes playing in a wedding reception band in high school, playing in a rock band that played at fraternity parties in college, playing solo guitar in a restaurant in the Central West End, and being a music director for a church. 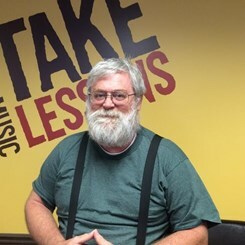 He has also been an active educator with experience that includes teaching elementary classroom music, elementary band, string and guitar classes, and teaching guitar as an adjunct professor at local colleges. His formal education includes a Bachelor of Music with lifetime K-12 instrumental music certification, a Masters in Educational Administration, and a Masters Certificate in Guitar. He has also studied a variety of instruments privately. Tom specializes in teaching all styles of guitar, and is just as comfortable with a classical guitar as he is with a high-gain electric guitar! Tom is able to teach anyone who is interested in playing guitar, whether they are a beginner or have been playing for many years, and his teaching method is adaptable to a variety of learning styles. Give us a call or stop by the store to schedule lessons with Tom! Request Lessons with Tom today!